Are you eligible for bankruptcy? | When can you go bankrupt? Home » Debt Solutions » Bankruptcy » Are you eligible for bankruptcy? as an Individual Voluntary Arrangement (IVA) or a Debt Management Plan (DMP). Even though bankruptcy wipes your debts and lets you start fresh once it’s finished, there are other debt solutions that might be worth considering. 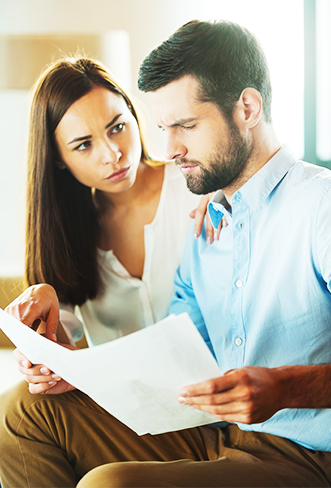 If you’re still thinking about bankruptcy, then it’s a good idea to take a close look at your current financial situation and consider if you are actually eligible. 1. You must be a resident of England, Northern Ireland or Wales. If you live in Scotland you should look into Sequestration, which is the country’s equivalent of bankruptcy. These fees must be paid and so you need to find this money before making your application – there are some charities and grants that can help you, if you meet the criteria for this. These fees can be made in instalments but the application won’t be completed until the full payment has been received. What happens when I apply for bankruptcy? Your application for bankruptcy is sent to the Adjudicator; they decide if you satisfy the conditions for bankruptcy. The Adjudicator has 28 days to review your application and make their decision. If the Adjudicator thinks you meet the requirements listed above, they’ll send your application to an Official Receiver. This person will then take control of your bankruptcy and also any assets you may have. It’s really important that you carefully consider whether you meet the requirements to apply for bankruptcy. For some people there could be a more suitable option. When should I look into other debt solutions? If you have at least £50 in disposable income – another debt solution could be a better option. If you work in the financial sector – if you have been declared bankrupt some professions won’t allow you to continue working for them. Check your employee handbook or contract before making your application. Before applying for bankruptcy, you should speak to a qualified debt advisor and look at all solutions available to you, to decide which would be the most suitable option for your circumstances. We are here to help and can assist you when it comes to making the right choice for your situation – just get in touch. If you’d like to talk to PayPlan regarding debt advice, speak to one of our team today by calling 0800 280 2816.